Cogeneration is an easy way for you, the customer, to greatly cut your fuel bill and cut your carbon footprint in half by making better use of the source fuel. This paper lays out some bricks of understanding so you can build your own cogeneration cycle or feel free to contact Green Energy Engineering, Inc. and we can custom design a cogeneration cycle for your process. You can do more useful things with a bottle of propane then you can with a hot water solar panel. While both represent energy, they also have a quality component. The hot water solar panel can be used to make hot water, provide space heating in the winter, or if supplemented with another booster energy source, produce air conditioning. The bottle of propane on the other hand can do all those things and heat a bar-b-que grill or drive a small engine. The engine in turn can provide shaft horsepower for pumping or spinning an electrical generator. The quality of energy can be related to temperature. The higher the temperature the more things it can do. The hot water solar panel which might reach 130°F cannot be used to operate a jet engine. However, high grade kerosene, burning at 2,000°F, can be used in a jet engine. Other fuels like oil, natural gas, coal, and wood burning at temperatures in excess of 1,000°F, can be used to operate boilers or engines that in turn can produce electricity or shaft horsepower. 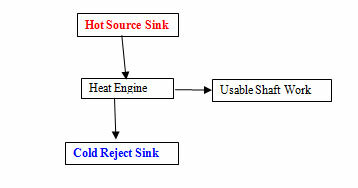 Notice that the heat engine efficiency increases as the hot source sink temperature increases. This is why researchers and engineers have been working on increasing the firing temperature of boilers, engines and especially jet engines. Jet engine turbine blade metallurgy, coatings, and cooling have progressed tremendously in the past 20 years and more is on the way. 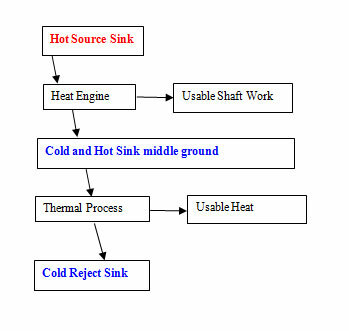 The fallacy of the above example is the exhaust or cold reject sink temperature. It is far too cold compared to real engines. The following table shows a more realistic estimate of typical operating temperatures for several types of engines. An internal combustion gasoline engine might have a burning temperature of 700°F and an exhaust temperature of 400 while a diesel engine might have an ignition temperature of 900°F and the same exhaust temperature of 400°F. A jet engine might have a firing temperature of 1700°F and an exhaust temperature of 1000°F. 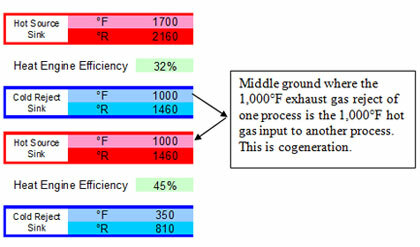 These types of engines and the temperature results in low overall engine efficiency compared to cogeneration. Assume that the hot source sink shown above is natural gas burning at 1,700°F in a combustion turbine generator and that the smoke stack exhaust temperature is 1,000°F. From the previous table we know that this would yield an engine efficiency of 32%. Now assume that this high temperature exhaust is now used as the input to a heat recovery steam generator producing 150 psig process steam and that the smoke stack exhaust temperature is 350°F. According to the following table, this second process has an efficiency of 45% and the overall cogeneration efficiency is 77% (32% + 45%) which means that more of the source energy (in this case natural gas) has been used. Domestic hot water or hot water heat in the winter can be produced from an electric hot water heater, a natural gas heater, or a solar panel. The cheapest source is the solar panel. Since the water only needs to be 100°F to 140°F then it makes financial sense to use the solar panel and keep the high quality fuels for a higher better use. We burn gasoline in a small engine and the exhaust is hot. The engine might be 20% efficient. If the hot exhaust is captured in a heat exchanger, it can heat air or water for other uses. This is simply a small example of a cogeneration cycle that might now be 40% efficient because of the captured and used waste heat. Residential air conditioners here in Florida have been retrofitted with lunch box-sized heat exchangers for over twenty years. The hot Freon gas from the compressor heats domestic hot water first and then flows to the condenser coil for more heat rejection before flowing inside to the evaporator coil. This is also cogeneration. The secret to a cost effective cogeneration cycle is to understand the process first. What is the process? Where is energy used? Are there other ways to do “it” with a different energy? What is the true thermal load? What is the electric load? Can any of the electric load be changed to another source like steam turbines or small combustion turbines? 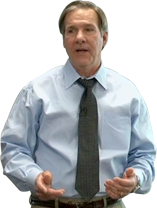 Have you done an energy audit? Have you analyzed the heat exchangers under a Pinch technology framework to understand the heat flows and temperatures? These are just a few of the many questions that need to be answered before a cogeneration cycle can be customized and optimized for both the process requirements and the project rate of return. The following is just a short list of the types of cogeneration cycles that Green Energy Engineering, Inc. has developed over the years. Wood fired steam boiler driving a steam turbine generator with 150 psig exhaust for process steam. Natural gas fired combustion turbine generator with hot exhaust gas routed to paper machine hot air drying system. Oil fired steam boiler driving a steam turbine generator with 150 psig extraction and 10 psig back pressure. Natural gas fired combustion turbine generator with hot exhaust going to a heat recovery steam generator for process needs. Oil fired diesel engine generator with both jacket cooling water and hot exhaust gas going to a heat recovery unit to provide process hot water. Light oil fired combustion turbine driving an oil transport pump with hot exhaust used to heat the oil for lower viscosity for 90 mile oil transport pipe line. Natural gas fired combustion turbine generator with hot exhaust used to produce hot water and then produced cold water in an absorption chiller. Natural gas fired combustion turbine generator with hot exhaust flowing into an oil fired boiler with conventional steam turbine generator. Also known as hot wind box. Bark fired boiler with steam flowing to a multi pressure extraction steam turbine generator. Sulfur fired boilers providing steam to steam turbine generator with extraction for evaporator use. The purpose of this cogeneration article is to provide an overview and introduction of the subject to the novice reader. This is a short paper with simple examples and the reader is encouraged to retain the services of an experienced licensed professional engineer, who has a track record of technical and financial success with cogeneration. The concepts presented here are simply some of the rain drops that eventually make a river. Hopefully this process perspective of the thermal cycles involved leaves the reader with the idea that there is no “one size fits all” solution. History has a debris field of those who only focused on the electrical side and ignored the process side. Some call this electric only focus a “PURPA Machine” (Public Utility Regulatory Policies Act) because the thermal load was questionable. The economics were questionable and some of those projects are no longer in operation. When properly developed, a process based cogeneration cycle can save fuel, save money, and save the Earth.